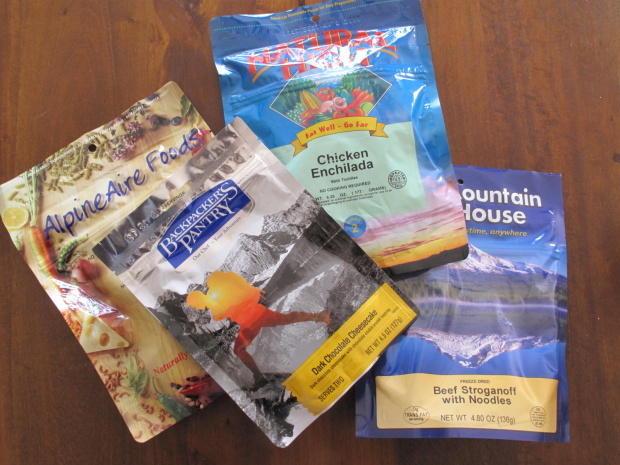 These are some ideas for trail food you can take with you backpacking or on day hikes. If you are out for more than a day hike you need to really consider weight, and perishability of your food. This means dehydrated / freeze dried food rules. You will be expending a lot of calories so you want to eat high calorie foods. You know, the stuff you are supposed to stay away from at home. Pre portion your food use a combination of drysacks / plastic grocery bags / ziplock bags to portion your food. Splitting into a grocery bag for each day makes it easy to find your food, and keeps you from accidentally overeating early in the trip. Don’t forget to hang your food & trash in a bear bag or bear canister. Packets of olive oil or canola oil are a good way to add healthy calories to lunches or dinners. You should focus on getting plenty of carbohydrates, they are the primary source of quick fuel. They will also help tired muscles replenish glycogen for the next day’s hiking. Fat is a good way to up the overall calories, eating fat before bed can help you stay warm at night. In winter or shoulder seasons a warm breakfast is a good start to a day in the outdoors, it may be worth the time and effort to heat breakfast. A common lunch strategy is to simply graze on snacks all day long. This avoids the time and effort of unpacking and preparing lunch. I personally prefer an actual lunch, but I try to make it low fuss. PB&J on Pita bread (better than regular bread because it won’t squish. A good tip is to put your PB&J in a ziplock bag. You can then just cut the corner an squeeze onto your bread when you are ready to eat. whole grain bagel with thinly sliced apple and gouda cheese. Sea Bear Smoked Salmon with crackers or chibata bread. Mountain house chicken salad (just add cold water) with a tortialla or bagel. It is always good to have a mix of salty and sweet snacks. After a few days of trail mix, and candy sweet food starts to sound pretty disgusting. A good variety of flavors making sure you include some savory options can help avoid this. Bananas / coconut milk are a great pre hike snack. They will give you calories and electrolytes. Cytomax / gatorade / hammer nutrition … (I keep a week solution of this in my camel back for a constant suply of energy and electroliytes) http://www.cytosport.com/products/cytomax.&nbsp; I prefer the powder kind because I can bring it in my pack and mix more on a multi day trip. For dinner you should consider dehydrated food. Many of these such as Backpackers Pantry, and Mountain house are cheep and really pretty darn good. If you want to reduce the sodium and the cost you could consider buying a deyhdrator and doing it your self. Thanks to the users at 14ers.com who provided some of these ideas.